Ever wonder how it is that a vehicle can be so easy or so difficult to steer? 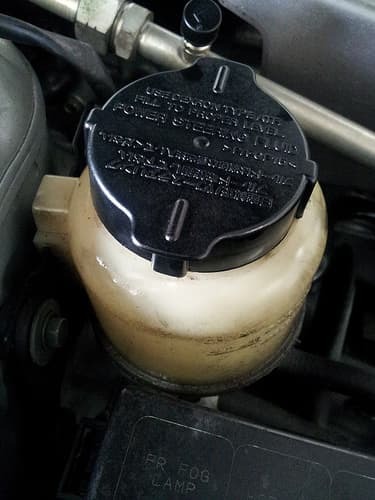 The answer lies in the power steering fluid. Like all components under the hood that require one type of fluid or another the power steering fluid acts as a lubricant so the hydraulic cylinder can transfer the needed energy to make the vehicle’s steering a lot smoother. Although there is really no set time when this type of fluid should be changed this article will discuss the signs that tell when it needs to be changed as well as how to change it. While there are a few ways to tell when it is time to change the power steering fluid out in the vehicle many manufacturer’s don’t give an exact specification for when it should be changed the best way to tell is through visual inspection. This way it can easily be seen when the fluid has been contaminated and when it has started to look clogged up. It is, nonetheless, it is important to change the fluid out as often as needed so that any of the power steering system’s components rust or degrade; this includes metal parts and the degradable o-rings as well. Do You Need To Change Your Power Steering Fluid? Although there are cars out on the market that may be designed to allow power steering fluid to last the entire life of the vehicle for many it is a requirement that this fluid must be changed. Unless dealing with a total replacement where all metal and degrading components are to be replaced changing the power steering fluid is not a difficult chore. Changing the fluid out requires nothing more then flushing the reservoir dry with the dipstick. After refilling the reservoir with a new batch of fluid, leaving it at the correct level, it is advised to turn turn the vehicle on and test the steering wheel for accuracy. The next thing that should be done is to get the engine running at its normal running temperature by driving the vehicle around for a few miles. When done check the fluids again and see if there is any brown or dirty coloring in the fluid, if so re-empty the fluid and refill with fresh fluid once more. In the end, the power steering fluid should be pinkish in color when checking it with the dipstick. Remember to get the vehicle to the temperature it normally operates at. ← USB Ports the New Norm?